There are many different forms of healing, but they all have one thing in common. Unlike western medicine which concentrates on one symptom at a time, holistic healing therapies work by bringing the whole body into balance. Think of it as an orchestra that needs to be in harmony. During his talk on Saturday 17th July, Jan van der Elsen said he in no way claims to be a healer, it is simply that various methods, and in this particular case, sound, stimulate the healing process. 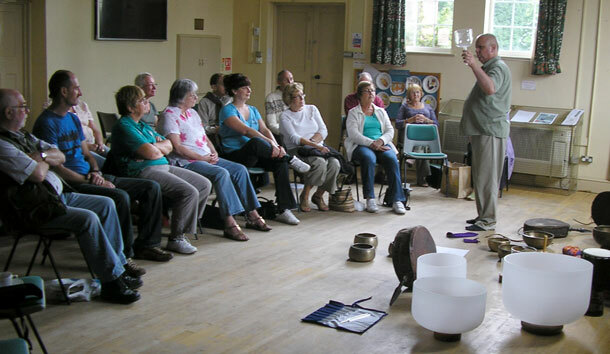 Standing in front of an impressive display of Tibetan and crystal singing bowls, tuning forks and ancient drums, Jan said everything we hear has a considerable effect on us, which in turn generates thought and evokes memories. Loud, unpleasant sounds such as a siren or an explosion, trigger the “fight or flight” reaction; whereas gentle, pleasant sounds, such as sweet music or birdsong on a spring morning, calms and relaxes us. Everything is in vibration, and is therefore affected by other vibrations. Jan demonstrated this by pouring water into one of his ancient Tibetan singing bowls, and asking someone to dowse its energy. “Seven,” said the dowser. Then Jan “played” the bowl with a cushioned wooden hammer, and showed us the vibrations rippling through the water. When the volunteer dowsed it afterwards, its energy was 8.5. And when he dowsed as Jan was playing, it was 9.5! Jan called for another volunteer and our dowser was asked to find the outer edge of his aura. 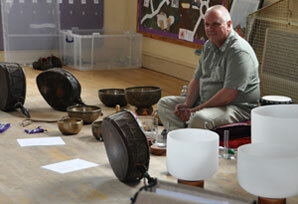 Jan then used a different-shaped singing bowl, struck it so it began to hum and used it to brush the volunteer’s aura for some minutes. When we measured his aura again, it had increased by at least three feet. With his wife Agnes, Jan will soon be mooring his restored Lightship near Gloucester Docks, where they will offer a variety of therapies, including sound healing.